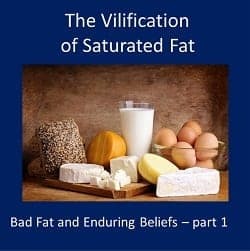 This is Part 1 in a new series titled Bad Fat Enduring Beliefs and this article looks at how and when saturated fat was vilified and why sugar was vindicated as the cause of heart disease. The diet-heart hypothesis is the belief that eating foods high in saturated fat contributed to heart disease was first proposed in the 1950s by a scientist named Ancel Keys who believed that by replacing saturated fat from meat, butter and eggs with newly-created industrial polyunsaturated vegetable oil (such as soybean oil) that heart disease and the deaths allegedly associated with it would be reduced by lowering blood cholesterol levels. 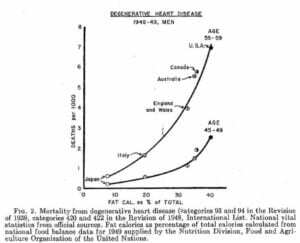 In 1952, Keys suggested that Americans should reduce their fat consumption by 1/3 and in 1953, Keys published a study where he said that he had demonstrated that there was an association between dietary fat as a percentage of daily calories and death from degenerative heart disease . 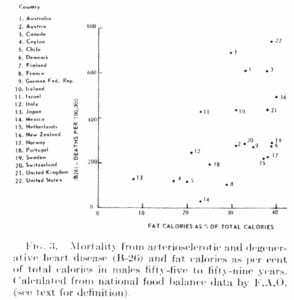 Four years later, in 1957, Yerushalamy et al published a paper with data from 22 countries which showed a weak relationship between dietary fat and death by coronary heart disease – a much weaker relationship than was suggested by Keys’s in 1953. Nevertheless, in 1989 Keys and colleagues published their Seven Countries Study which maintained there was an associative relationship between increased dietary saturated fat and Coronary Heart Disease – basically ignoring the data presented in Yerushalamy’s 1957 study, and which failed to study countries where Yerushalamy found no relationship between dietary fat and heart disease, such as in France. The paper maintained that the average consumption of animal foods (with the exception of fish) was positively associated with 25-year Coronary Heart Disease death rates and the average intake of saturated fat was strongly related to 10 and 25-year Coronary Heart Disease death rates. Keys and colleagues knew of the Yerushalamy’s data from 1957 and seemingly dismissed it. The paper has been widely criticized for selecting data only from the 7 countries that best fit their Diet Heart Hypothesis. In August of 1967, Stare, Hegsted and McGandy – the 3 Harvard researchers paid by the sugar industry published their review in the New England Journal of Medicine, titled “Dietary fats, carbohydrates and atherosclerotic vascular disease” which vindicated sugar as a contributor of heart disease and laid the blame on dietary fat and in particular, saturated fat and dietary cholesterol (previous article on that topic here). This is an important point; prior to a major study having ever been conducted to determine whether changes in dietary cholesterol impacts heart disease, 3 Harvard researchers paid by the sugar industry concluded that there was “only one avenue” by which diet contributed to the development and progression of atherosclerosis (i.e. “hardening of the arteries”) and heart disease and that was due to how much dietary cholesterol people ate and its effect on blood lipids. Only ten years after the sugar industry paid Stare, Hegsted and McGandy to write their reviews, the same Dr. Hegsted was directly involved with developing and editing the 1977 US Dietary Guidelines  which recommended an increase in dietary carbohydrate and a decrease in saturated fat and cholesterol in the diet. 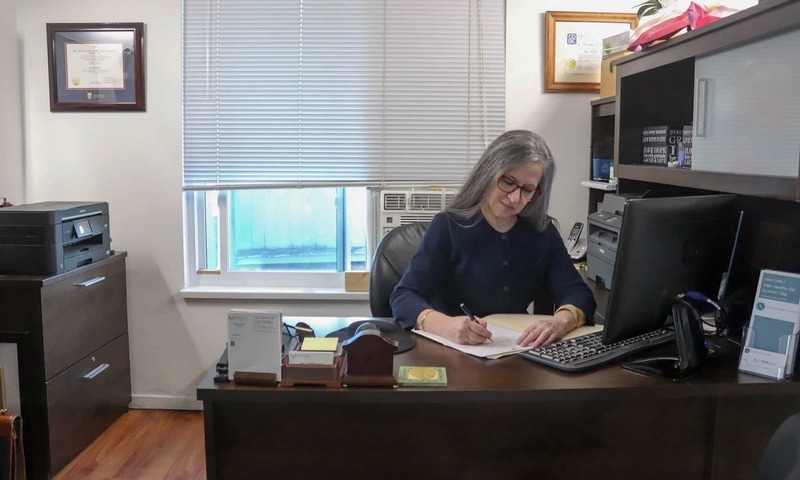 Historic changes in the Dietary Recommendation in Canada have largely been based on changes to the Dietary Recommendations in the US, and as a result both stemmed from a belief that eating saturated fat increases total cholesterol and therefore increases the risk of heart disease. The problem is this belief is just that, a belief. There have been many studies that have disproved this including a randomized, controlled dietary intervention trial from 2008 which compared a low calorie, low in fat with a low carbohydrate, high fat diet of the same number of calories. This study found that overall heart health is significantly improved when carbohydrate is restricted, rather than fat [7,8]. Not all LDL cholesterol is “bad” cholesterol. Small, dense LDL (“Pattern B”) causes more “hardening of the arteries” than the large, fluffy LDL particles (“Pattern A”). It has been reported that when dietary fat is replaced by carbohydrate, the percentage of the small, dense LDL particles (the ones that cause hardening of the arteries) is increased, increasing risk for heart disease. Furthermore, the low carb diet increased HDL (so-called “good” cholesterol), which are protective against heart disease and HDL and small, dense LDL were made worse on the low fat diet. Quite opposite to the “Diet-Heart Hypothesis, this study demonstrated improvements in the risk of heart disease for those eating a low carbohydrate, high fat diet compared to those eating a low fat, low calorie diet – which is not all that surprising given that it had been reported previously that a diet high in saturated fat actually lowers small, dense LDL (the type of LDL that causes hardening of the arteries) and raises the large fluffy LDL; actually improving risk factors for heart disease . There are also other randomized controlled trials from 2004-2008 which demonstrate that a low carb diet improves blood cholesterol test results more than a low fat diet [10,11,12,13,14] – yet despite this, the belief that eating saturated fat increases blood cholesterol, persists. Both the American and Canadian governments are in the process of revising their Dietary Guidelines and what is clear is that what is needed is an external, independent scientific review of the current evidence-base for the enduring false belief that dietary fat, especially saturated fat contributes to heart disease. Have questions about how I can help you follow a low carb lifestyle? KEYS, A., Prediction and possible prevention of coronary disease. Am J Public Health Nations Health, 1953. 43(11): p. 1399-1407. Kromhout D, Keys A, Aravanis C, Buzina R et al, Food consumption patterns in the 1960s in seven countries. Am J Clin Nutr. 1989 May; 49(5):889-94. The National Diet-Heart Study Final Report.” Circulation, 1968; 37(3 suppl): I1-I26. Report of the Diet-Heart Review Panel of the National Heart Institute. Mass Field Trials and the Diet-Heart Question: Their Significance, Timeliness, Feasibility and Applicability. Dallas, Tex: American Heart Association; 1969, AHA Monograph no. 28.